With summer just around the corner, and hopefully some warmer weather, the car festival season is almost upon us. Petrol heads are spoilt for choice for car shows in 2017, with many owner clubs holding regular meetups and races, such as for MINI drivers, classic Jaguar cars and more. To help we’ve picked out our favourites in the UK this summer. Taking place across the city, Coventry MotoFest is a true celebration of motoring in the West Midlands. Fill your nostrils with the scent of burning rubber in the Action Arena, visit some vintage cars and specialist vehicles (or even display your own) in the Coventry BID Classic space and watch some high-speed tours racing around the city’s ring road, all being well. What’s more, it’s all free! Adrenaline junkies, this is the one for you. It’s in the name anyway, but the Goodwood Festival of Speed truly delivers all the high-octane and fast thrills you could desire. With this year’s theme being ‘Peaks of Performance’, expect to see plenty of top level super, F1, rally cars and bikes in action. From the Luxe Lawn displaying beautiful new models, to the action areas and iconic hillclimb, no motorsport fan will leave dissatisfied. There’s a real festival feel to Car Fest, as few other events in our list feature fun fair rides and a ‘car’-nival parade! With two versions of Carfest, one up north and another down south, it offers a great family day out or weekend, no matter where you live. A mix of modern and vintage car exhibitions, races, live music, hill climbs and so much more fun is in store. Dreamed up by Chris Evans, all the proceeds go to Children in Need as well, so you’ll be having fun and doing some good at the same time! Tewkesbury Classic Vehicle Festival is the best car show over summer for those who appreciate a bit of history. 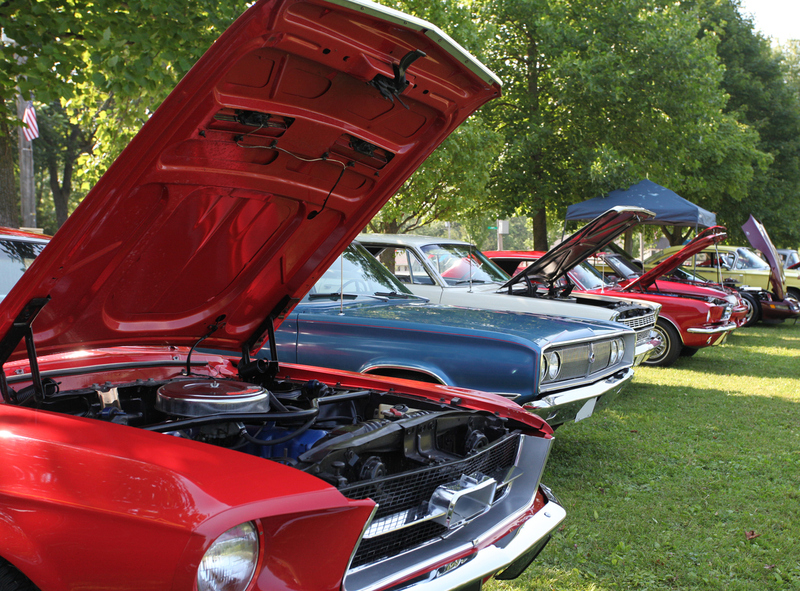 More than 700 cars and 200 motorcycles from decades gone by will be descending on the town. Thousands of visitors are expected to make the most of the countless market stalls, BBQ, auto jumble and more. Plus, classic show car and motorcycle drivers will get in for free (though passengers must pay £5 each). Take a trip back in time to Goodwood Revival. The annual, three-day event sees classic cars and motorcycles that were around in Goodwood Circuit’s legendary era of 1948 to 1966 race round the track again. Off the circuit, you’ll find visitors in full vintage dress, a recreated, classic high street and a plethora of fine cars and drivers on show. What could be better than watching a pair of world-class dragsters speed down the track on a late summer weekend? If you can’t think of anything, then the FIA/FIM European drag racing finals are for you. The quickest drag cars and bikes from across Europe will compete over such short distances in this prestigious and televised event. While monster trucks, stunts, drift cars, fireworks, fun fair rides and more make up the rest of the entertainment. All these summer car shows have something different to offer, but will each make a great day or weekend out. There are plenty more smaller motor shows on throughout summer as well, if you’ve got a free weekend in between. Should a visit to any of these summer car shows inspire you to update your car or revert to a classic vehicle, then check out AA Cars for buying a used car, as we have a broad selection of quality vehicles to suit all tastes and needs.